Saulo Melo is with Why Not Milan, 40 Graus Models Brazil. PONY RYDER: When did you start modeling? How were you scouted? 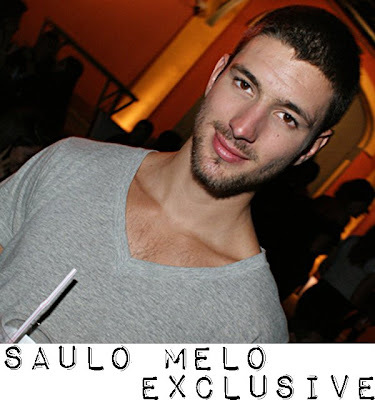 SAULO MELO: I was at a party in Rio de Janeiro and was scouted by Sergio Mattos. PONY RYDER: Why did you stay in the same agency during all your “modeling” time? SAULO MELO: I stayed at the same agency during all this time because they are really good and they really pay attention to me. It’s not the glamour, they really wanna make money, and that’s what I want too. PONY RYDER: When you were starting as a model, was it strange for you to do shootings? PONY RYDER: Do you like the attention that you are getting? Do people recognize you on the street? SAULO MELO: No, I don’t like it too much... would be good if I got a lot of money with no one recognizing me..ahahaha.. . Some of my friends always talk about the photos they have seen =). PONY RYDER: Do you mainly have positive or negative experiences with fans? PONY RYDER: What is your hometown, and what do you like about it? SAULO MELO: My hometown is a city close to Rio.. it’s called Niteroi… you just have to cross the big bridge that is in Rio.. It’s the best place in the world. People here know each other..wherever I go I have people I know..the women are the best in the world, and the beach is like a paradise...you have to check this out on Google! The beach is called ITACOATIARA.. it’s like a dream come true. PONY RYDER: Who is Saulo? SAULO MELO: Well.. I am a really simple man.-.who doesn’t like the glamour of life..I hate to be dressed up..I like to be at the beach with my girl (but I’m single now) surfing,.climbing the mountains. I like to practice some jujitsu. Than at night I like to have some Japanese food and spend some time with my girl and go to sleep to wake up early..
PONY RYDER: Does your family support you in your modeling career? SAULO MELO: I have a wonderful family that supports me at whatever I want to do..
PONY RYDER: How did your life look like before modeling? SAULO MELO: My life before I was modeling was based on my studies. I am still doing it but sometimes I take a break to travel somewhere. PONY RYDER: As someone living in Brazil, do you dance? Or at least do you attend the carnival? PONY RYDER: Is it true that the Brazil has special energy that can not be felt in other countries? If so, why? SAULO MELO: That’s true... but I think you can find some good energy in Africa, too.. The difference in Brazil is that you find a multiracial population that is so beautiful and happy that you can look at the crowd and feel the energy of all countries together.. I don’t know how to explain… just being here to feel and explain to yourself. hahahahaha. PONY RYDER: Brazil is well known for their models! Who is your favorite Brazilian model? PONY RYDER: What is your favorite picture of yourself? SAULO MELO:...I really don’t have a favorite one here too..ahahahaha but I have a black and white picture of my family together that I will carry with me forever..it wasn’t for work..but was with a professional camera..the pic is fantastic..ahahaha could be some family editorial or something. PONY RYDER: What kind of jobs would you like to work in the future? SAULO MELO: I would like to do a perfume campaign.. like ten - it would be nice hun? PONY RYDER: Tell us something about your workout routine. How often do you lift weights? PONY RYDER: What do you think is your strongest feature? 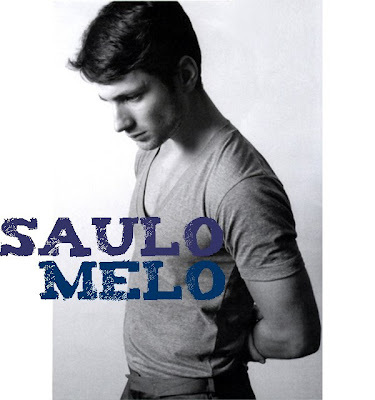 SAULO MELO: I don’t know what is strong on me. I think it is my smile. PONY RYDER: What type of sports do you do? PONY RYDER: Do you have to maintain definition all year long, or do you have a period when you just work on your muscle mass? SAULO MELO: I think not having a routine in your life is the best way to get all the results..everything needs to be balanced. I don’t have a trainer. I do the cardio by climbing the mountain on foot..You know? Doing the drill..
PONY RYDER: Do you take care of what you eat? SAULO MELO: I don’t take care a lot..but I like to eat healthy..not a diet but healthy food. I love life, I will make everything to live longer..
PONY RYDER: What is your favorite food? PONY RYDER: If you are eating out, where do you go? What is the place that has the best food for you? PONY RYDER: Do you usually take your dates in restaurants…or? SAULO MELO: Yes..so we can talk and get to know each other, have some drinks and feel comfortable. I prefer restaurants. PONY RYDER: Which beer is your favorite? SAULO MELO: My favorite beer is SKOL or ITAIPAVA. Brazilian beer. PONY RYDER: What do you usually drink when you are out? What is your favorite juice flavor? SAULO MELO: I drink caipisaque of kiwi..really good. PONY RYDER: How do you spend your summers? SAULO MELO: I spend my summers going to the beach (Itacoatiara). PONY RYDER: Do you like more Havaianas or Ipanema flip flops? SAULO MELO: I don’t like any of those..they cut my foot when I walk ahahahah..really..
PONY RYDER: What eyewear brand are you wearing right now? SAULO MELO: I am wearing EVOKE eyeglasses..
PONY RYDER: Are you afraid of sharks? Did you ever see one? SAULO MELO: Here in Brazil we don’t have sharks..thats a good thing..I’ve never seen one..
SAULO MELO: The message for the readers and for everybody is: Don’t let your life pass without being lived..there are many ways to enjoy your life.. Exclusive interview with model Saulo Melo is original work by Pony Ryder.